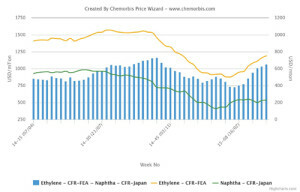 In Asia, spot ethylene prices have been recording significant increases on the back of tight supplies, owing to the plant shutdowns in the region, many of which began April and are expected to last until the June-July period, according to ChemOrbis. 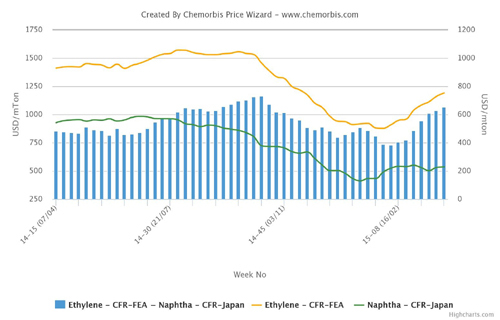 According to Asian players, spot ethylene prices were $75/ton higher on CFR Northeast Asia basis and $40/ton firmer on CFR Southeast Asia basis from early April levels at the end of last week. When compared with early March levels the increases are even larger at over $300/tonand as high as $380/ton. These hefty increases were attributed to supply concerns in Asia. There are several plant shutdowns in the region, according to ChemOrbis. LG Chem’s 900,000 tons/year cracker located in Daesan, South Korea was shut by mid-March for an annual maintenance. The cracker is still shut and is expected to restart by April 19, according to initial plans. Meanwhile, Samsung Total’s 700,000 tons/year cracker in South Korea is also to go under a maintenance shutdown, in line with their polyolefin units, in April. The shutdown is planned to take around 40 days. BASF-YPC’s 740,000 tons/year Nanjing cracker in China will also be shut for two months of maintenance, starting in April. Japan’s Idemitsu Kosan is mulling over shutting their 374,000 tons/year cracker these days for about two and a half months. The cracker is to resume operations by around June. Mitsubishi Chemical is to shut their 495,000 tons/year cracker located in Japan by the second half of May for a month long turnaround and expansion work. Formosa, meanwhile, is to shut their 700,000 tons/year Mailio cracker on June 9 for a turnaround. However, the duration of the shutdown has not been disclosed, by the time of publishing. Apart from these, Mitsui Chemicals is to shut their 600,000 tons/year Chiba cracker in Japan for 45 days by mid-June. CPC is also mulling over shutting their 380,000 tons/year Taiwanese cracker, located in Linyuan for 60 days in the fourth quarter of 2015.